It is long known that alcohol can pose a significant risk to human health. However, alcohol is consumed worldwide in large amounts, with former Soviet Union republics Moldova and Lithuania reporting the highest alcohol consumption per capita. 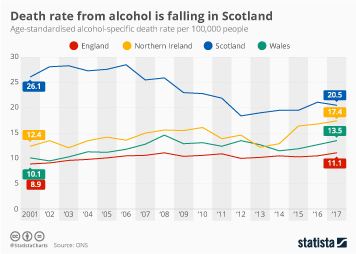 The World Health Organization (WHO) estimates that around 3.3 million deaths are related to harmful use of alcohol worldwide – that is almost six percent of all deaths around the world. Alcohol consumption triggers many diseases, such as several types of cancer, cirrhosis of the liver, and cardiovascular diseases. It should be kept in mind that behind all these facts stands a large and established industry. In addition, governments around the world collect billions of dollars in alcohol tax revenues. In 2015, on average, every person in the United States consumed around 24 gallons of alcohol, over half of which was in the form of beer. Alcohol use in the U.S. was highest among white Americans, as of 2016. Just as there are different alcohol consumption rates for the different ethnicities in the U.S., there are also differing binge drinking rates among the states. The District of Columbia reported the highest binge drinking rates in 2017, whereas West Virginia reported the lowest. A problem under special observance is alcohol abuse among children, adolescents, and younger people. In 2017, the lifetime prevalence of alcohol use among those in grades 8, 10 and 12 stood at 41.7 percent, a significant decrease from prevalence rates recorded in the early 1990's. However, binge and heavy drinking is relatively common among those alcohol users aged between 20 and 25 years. On average youths aged 12 to 20 years drank around 4.26 drinks on those days that they did drink, as of 2015. Annual costs related to alcohol consumption are estimated to amount to around 249 billion U.S. dollars. This amount includes health care, lost work productivity, and crime. Some 27 billion U.S. dollars are spent per year on alcohol-related health care issues alone. There were around 2.2 million alcohol-related treatments in the United States in 2016. Still, only a small portion of people with alcohol use disorders receive help through various types of substance abuse treatment. Topic: Mental health issues in the U.S.
Topic: Substance abuse treatment and rehabilitation in the U.S.
Topic: Adolescent drug use in the U.S.
Topic: Drug use in the U.S.
Topic: College student health in the U.S.